If there is no data displayed in your analytics reports, there are a few checks you can make. The first reason for no data being displayed is the number of visitors you have on your site. If there are no visitors, there is nothing to be displayed. Below we will present a few checks you need to make when dealing with empty analytics reports or reports displaying a No Data message. Are you looking at the right Property/View? 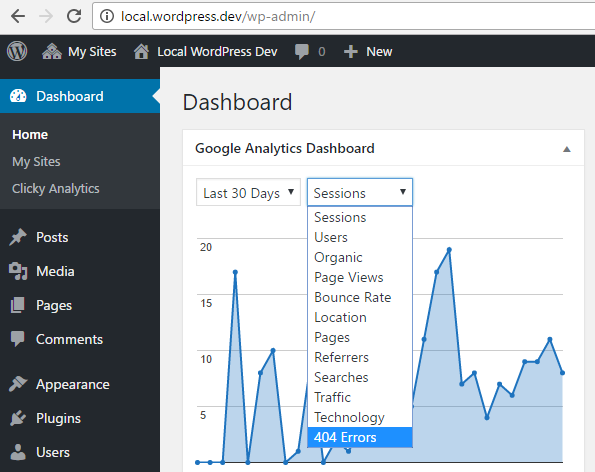 By default, the plugin will send data to the Property selected under Google Analytics -> General Settings screen and display reports for the same Property. Because you can switch the Property or the View from your dashboard widget, make sure you’re looking at the right data. You should check if the Property/View selected on the widget matches the one you use to collect the analytics data (the one selected on General Settings screen). Does the tracking code work properly? You may experience empty analytics reports because there are no visitors on your site or the tracking code is not inserted in your webpages. If you have a new site, it would be a good idea to disable the Exclude Tracking feature temporary, so you can track your own visits on frontend. You can disable tracking exclusion for all roles from Google Analytics -> Tracking Code -> Exclude Tracking. If you’ve just created a new Property, there may be some delays on reporting. While the reporting starts almost immediately, there are users experiencing up-to 48 hours lags. To further debug the tracking code, please follow: How to check if Google Analytics tracking works. To protect the entire ecosystem there a few limits for the Google Analytics API usage. The plugin itself uses a quite complex cache system to keep the API requests at a reasonable level while providing the best user experience possible. Today report – will refresh hourly. Yesterday, Last X Days, and X Years reports – will refresh at midnight, based on the time zone set in your Google Analytics account. Real-time report – will refresh every 55 seconds. To force a report refresh, you can use the Clear Cache button from Google Analytics -> General Settings screen. As a general recommendation, if you’ve created a new Google Analytics account, please make sure that the tracking code works properly. In addition, you should wait for a reasonable time, around 48h, for the analytics reports to pop-in. If you’ve set Code Placement to HTML Body and your theme doesn’t have a WP Footer hook, no tracking code will be inserted in your pages. You should either add this hook in your theme’s footer.php file or switch the code placement to HTML Head. Considering the wide usage of WP Footer, you should report the lack of this key functionality to the developer of your theme. you are dealing with a wrong configuration of your Google Analytics account. If so, please check your account configuration and settings on analytics.google.com.